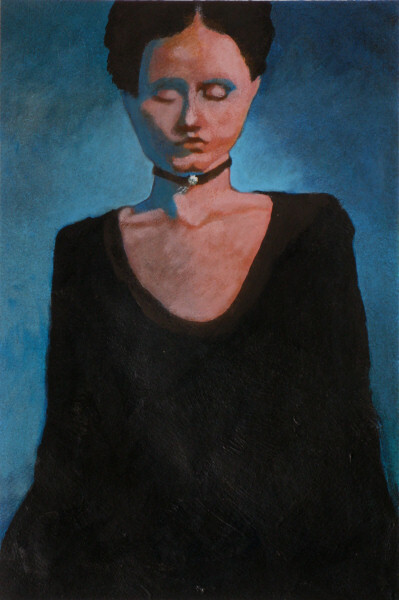 Ken Auster is a world-class artist whose work I greatly admire. I'd like to incorporate some of the exciting things he does in my own work. On the other hand, I don't want to just copy his picture. He does give workshops. I could watch him paint, listen to his lectures, have his personal comments, ask questions. Unfortunately his studio is in Laguna Beach probably a three day drive from north Idaho. Maybe someday. In the mean time I'll analyze this painting...try to figure out how he achieved this stunning result...then apply what I learn. What was my gut level reaction to this in the first split second before I even realized what the subject matter was? I felt an excitement...wow, oh yeh! I instantly liked it. You can learn to take note of that first impression. When it is positive analyze your reaction because whatever it was you liked so much is the very thing that you should be doing and the very thing that will improve your own paintings. Looking at this thumbnail is something like a first view at a distance. You can't really tell what those shapes are, but it still grabs you. How does Ken invoke this emotion in the viewer? He does it with a strong artistic concept or visual idea. What is the artistic concept here? 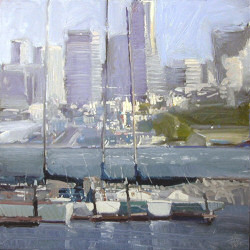 How about "sail boats at the dock"? That is the subject matter, but subject has nothing to do with the success of a painting as a work of art. 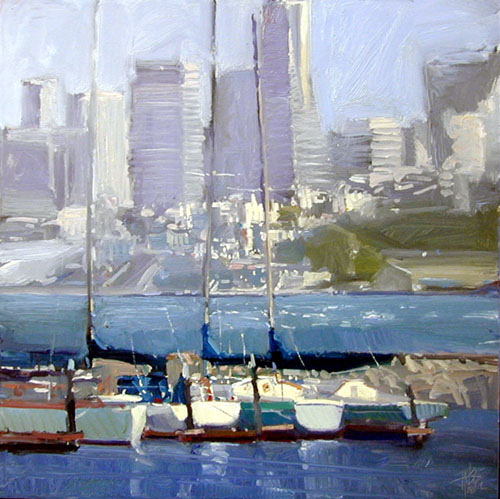 If Ken had gone to the marina and said to himself, "I'm going to paint these sailboats" and nothing more, we wouldn't be analyzing his painting. And, of course, that is exactly what many amateurs would have done. Almost certainly the result is another dull painting. Visual idea has to be something that is above and beyond subject, something that can be used to organize the surface of the canvas into a unified whole, something that simplifies reality, something that can convey an emotional message or feeling tone, something you can do with paint. Professional artists know the secret of artistic concepts. Amateur artists and the general public are aware of them, but not on a conscious level. Paintings are really about ideas, as is all art work. 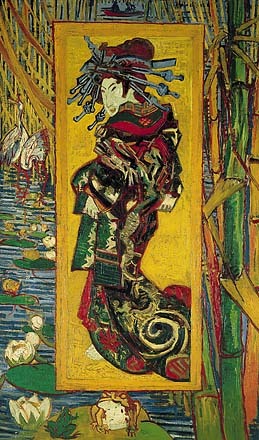 The elements and the principles of art as well as painting techniques are used in a manner that achieves the picture's main visual idea. Many artistic concepts have to do with the play of light. Not too surprising since painting is dependant on vision. In this picture Ken entertains the viewer by suggesting strongly the natural effect of aerial perspective. And that's his artistic concept: aerial perspective. Simple, but essential. Interesting, but no longer exciting; no feeling, no emotion left. It's message is move along, nothing to see here. You may have a painting or two like this at your house. Even though this version has many good features, if Ken's paintings looked like this he would not be the world class artist he is. The composition is excellent. The draftsmanship is excellent as are the shapes and the warm and cool grays. I removed the aerial perspective by reducing the intensity of the colors and the contrast of everything below the far shore. Everything above is untouched. Doing that took the life out of it. The magic is gone. If I do a painting based on what I learn from Ken's painting the most important thing is his artistic concept. Now that we know what that is let's analyze it further. We begin by noting that the foreground is empty and relatively inactive, but with intense color. In strong contrast the middle ground is very active with the lightest lights, the darkest darks and the widest range of color. The water shape above the boats is a transition area. Starting with a blue that is less red and less intense than the foreground and lighter in value, the water gradually becomes lighter and grayer. Now we're in the background which is a marvel of cool grays; large, small and medium shapes; interesting patterns plus quiet, restful areas. We pretty well understand Ken's secret. Do we dare use it in our own work? What about copyright laws? Will Ken be angry if he finds out? He shouldn't be upset because aerial perspective goes way back hundreds of years. Most likely he first noticed it in a painting by some artist he admired and wisely made it his own. Now he does it as well as anyone ever has. 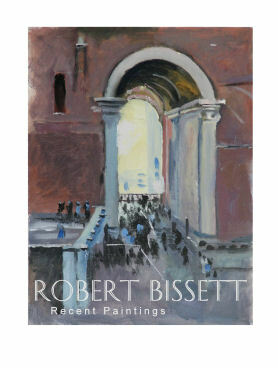 In fact, if you go to his website's gallery page you'll see a lot of landscapes and cityscapes. Most of them are about aerial perspective, empty foreground, main interest in the mid-ground and misty background. Is that all there is to it? No, but it's a huge step in the right direction. 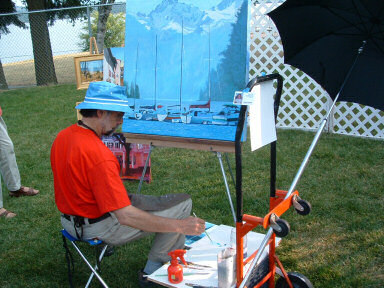 If you spend your easel time applying this artistic concept like Ken does your paintings will improve greatly. It's a formula that can be used in a wide variety of landscapes. Once you fully internalize this idea you will look at your own paintings with a fresh eye. You will instantly see how they can be improved and you'll wonder why you never noticed before. I've used Ken Auster's idea, but made it my own. This is a picture I've had in mind for several years. Mine is 36x36", his is 30x30". Mine is acrylics rather than oils. Instead of a San Francisco Bay scene, I have a protected harbor somewhere in Alaska. Instead of towering buildings, I've depicted a towering mountain. 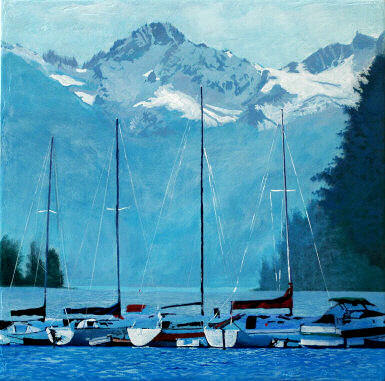 I've combined my own boats and trees from a northern Idaho lake with a mountain from Seward. The feeling-tone is completely different from Auster's, the paint application is different, I've got more blue rather than gray in the background. Even a big Ken Auster fan did not recognize where I had borrowed this idea from. Here I am on August 14, '05 at a nearby wine tasting event prior to an outdoor all Beethoven concert. I got very little painting done because of constant interruptions. People had positive reactions which I was glad to learn since I'm never quite sure. "It feels so calm." "I'm drawn into it." "I know the wall it can go on." They wanted to know where it was. Even in this unfinished state it is a successful painting. It should only improve when I add more color spots to the boats to bring them further forward. This is how you learn from other artists...borrow their visual concepts to improve your own work. Critique and analyze, identify the visual idea, plan carefully, then get out your paints and raise your work to a new level! If you try this yourself, and I hope you will, send me a picture. Here's the photo that inspired the painting below. Beautiful photo and model, but I don't want to copy it. I want to take part of the concept, change it and make something completely new. 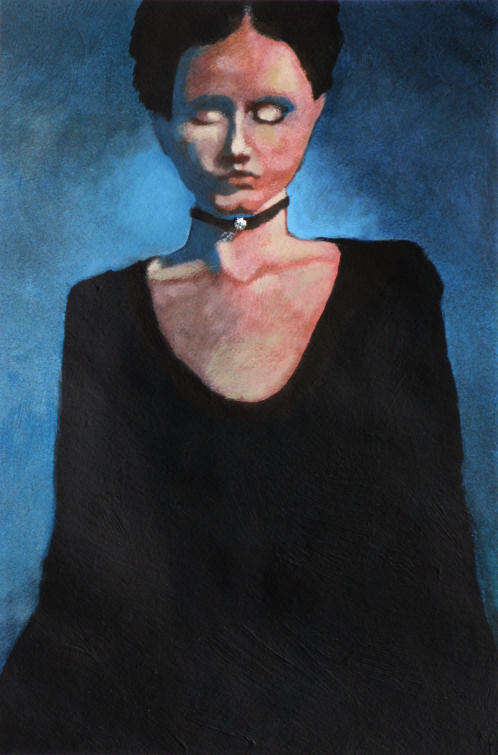 In this case I borrow the composition and the pose and add a different model, dress and choker. Also the color scheme and values are very different. How far can you go when borrowing from another artist? What about the modern masters like, say, Van Gogh? Well, here's one example. SIZE OF OBJECTS - smaller objects seem farther away (distortions can occur if objects are the same size or too close to the viewer). OVERLAPPING OR SUPERIMPOSING - by partially covering one object with another it gives an appearance of depth (distortions also occur if viewer is too close). TEXTURE - density increases as an object gets further away. SPACING - objects clustered closer together seem farther away. Horizontal lines which get closer as they near the horizon line appear to be defining a recession in space. FOCUS - objects lose detail as they recede into space. BRIGHTNESS - objects are brighter when closer to the viewer, except for reflective surfaces. SHADE AND SHADOW - darker shadows seem closer especially if overlapping other shadows. UPWARD ANGULAR LOCATION - creates depth if juxtaposed to ground and sky lines, e.g. tall buildings. COLOR - color intensity is much greater closer to the viewer and tends toward medium gray as it recedes. Art is by definition an abstraction of reality. It may be more or less representational, but the exciting part is the abstraction.